The Fellowship was fortunate enough to obtain a copy of LONG DISTANCE #3 from IDW Publishing. The story is written and illustrated by Thom Zahler. Carter and Lee’s relationship has hit a new level…even those three “special words” might be used. Carter even gets the opportunity to meet Lee’s grandmother, but she apparently DOESN’T approve. Things seem to be going well there, our lovebirds’ work environments are becoming more challenging. Carter’s advertising firm is growing; while Lee must deal with the political and financial issues of science work. And the reality that they are so far apart from one another truly sinks in. Zahler is the creator of LOVE AND CAPES and the hallmark of that great title is how real the characters are and the complexities of the relationships. It’s the same here with not only Carter and Lee and their circle of friends. I want to note Zahler’s interesting choice of not coloring the art (in the usual sense) or going black and white. He goes with shades of Green (to represent Carter’s world) and orange (Lee’s world). Definitely gives the book a different look and I like it. 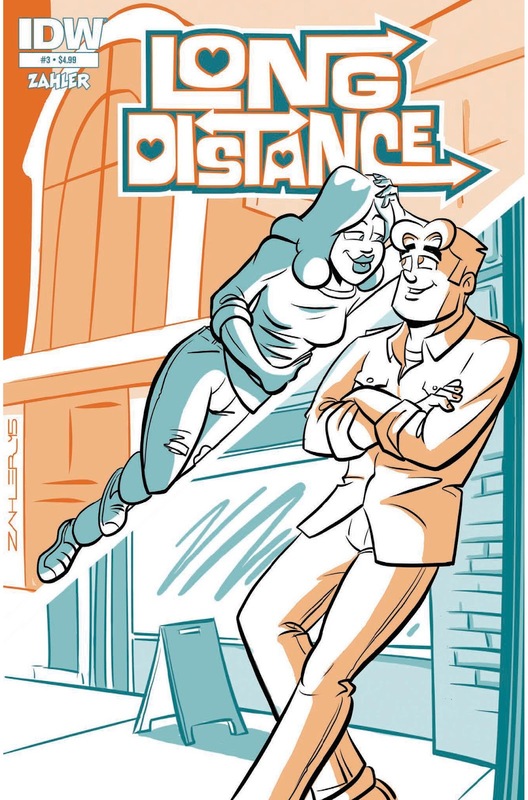 LONG DISTANCE is a comic well worth picking up. LONG DISTANCE #3 is in stores now, or available for ordering at www.idwpublishing.com.